'His dream was to play rugby and play for Ireland and he lived that dream, and it's a credit to him.' - Eric Elwood. 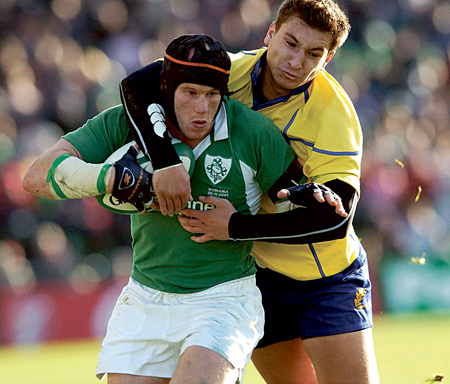 Johnny playing for Ireland against Romania. Long-serving Connacht flanker and former Ireland international Johnny O'Connor has announced his retirement from the game. The 33-years-old openside, who has spent 14 years playing professional rugby for both Connacht and English premiership side Wasps, said his body was telling him to stop. Nicknamed Johnny 'O'Concrete' for his fierce tackling, O'Connor spent three years playing for the London club during which time he won two Heineken Cup medals, two premiership titles, and a Powergen Cup under Warren Gatland. It helped propel him onto the international stage where he earned 12 caps for Ireland, making his debut against South Africa in 2004. The following year he won the IRUPA Players' Player of the Year award. Connacht coach Eric Elwood said it was with "great regret" he accepted O'Connor's announcement. "Johnny was always earmarked as someone special in the game. He played hard, he was committed, dedicated, brave and courageous, and that's the way he played the game. It is no coincidence that now he is coming into this retirement because his body cannot take any more. "Johnny has been a great servant of Connacht, and our supporters loved him because they love a guy in a green jersey who gives 100 per cent and that was what Johnny did every time he played. Elwood said O'Connor was an example of someone who had fought for his dream. "His life was always rugby and his ambition, no more than myself, was always to play for Ireland. Coming from the west of Ireland, it was difficult, but he was never deterred from his goal. He persevered, worked hard, and challenged himself when he went to Wasps." It was former English captain Lawrence Dallaglio who encouraged Gatland to sign O'Connor for the London outfit. In a pre-season fixture between the two clubs, Dallaglio asked who was the "bloody No 7 who was a complete nuisance" throughout the match. His time with Wasps was well spent. In addition to the silverware, he became the centre of attention from both the English and Irish rugby unions for representative honours. O'Connor's loyalty to his country was never in doubt, but it did help force the hand of then Irish coach Eddie O'Sullivan and as a consequence O'Connor deservedly went on to wear the Irish jersey on 12 occasions. Elwood said it was unfortunate O'Connor's international career had not been longer, but there had been huge competition in the backrow at the time. "His dream was to play rugby and play for Ireland and he lived that dream, and it's a credit to him. He was not the biggest, but he was brave, and courageous, and he boxed above his weight in every game he played in. You knew when you got tackled by Johnny O’Connor, something had hit you with purpose." Always modest, O'Connor said he was happy with the decision he had now made. "I've enjoyed my playing career massively. All the coaches and support staff I've worked with at both Connacht and Wasps have pushed and moulded me into the player and the person I am today, " he said. "I'm thankful for the wonderful friends I've made through rugby over the years. I've played with and against some fantastic people. Its other players' commitment and sacrifices that have helped me develop on the pitch and that sort of unity is what makes the sport of rugby so special." With a degree in strength and conditioning, O'Connor hopes to remain working in the rugby industry and with Connacht in the future. Currently suffering from an ankle injury, O'Connor is one of several players ruled out of Saturday's RaboDirect Pro 12 fixture with Treviso, including Dave McSharry (groin ), Kyle Tonetti, (ankle ), Jason Harris-Wright (calf ), Eoghan Grace (thumb ), and Michael Swift (knee ). The difficult trip comes comes after a disappointing 22-0 defeat to Munster. "We promised ourselves we would front up, and we didn't do it. Ironically we lost the game at the start when they went 12 - 0 up after 14 minutes. Unfortunately we left it too late and after 79 minutes we showed bravery and didn't let them in for a fourth try. If we had shown that same intent at the start of the game, it could have been a different proposition and that is what is disappointing. Munster dominated the opening 20 minutes, utilising their maul, led by returning talisman Paul O'Connell, and although Connacht did create a couple of chances, they were unable to score. Munster enjoyed a 15 - 0 lead at the break, and grabbed their third try by the 50th when Damien Varley scrambled over. "You do not get too many opportunities against good teams, but when we got down there, were forced it, turned it over, or didn't recycle quick ball, so between attack and defence, we let ourselves down." Heading to Treviso, Elwood says Connacht have now made it harder for themselves. "They are in a good place having beaten Munster, drawn with Ulster, and beaten Cardiff so they have a massive opportunity to pull clear and this week it is going to be harder than last week. However I am looking for a backlash from our guys in their performance." Although Connacht have won three of their five previous meetings, Treviso are currently enjoying their best form, reflected in their national side's improving Six Nations. "We know we can go there and win, but the challenge is more difficult. They have won their last three on the bounce and they have their internationals back so it is important we get something out of the next two games away so we can finish on a high at home. We are looking for some 'bounce-back-ability' this week."